RC Garbage Truck, Dream Big Kids… Dream Big | OhGizmo! By Andrew Liszewski on 03/29/08 • Leave a comment! I don’t mean to demean my local refuse pickup professionals. In fact, most people don’t realize how important their jobs really are. (And they probably have a great union.) But is this remote control garbage truck the best way to a foster a child’s mind? 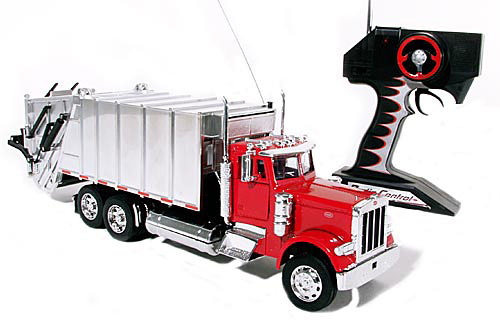 Sure it’s a pretty accurate 1:32 scale model of a Peterbilt 379, but quite frankly I’d be a bit worried if my kid spent their childhood driving this thing around the house making scheduled stops at every room. It’s 13.5 inches long, features opening cab doors and a fully-functioning refuse container in the back. It also includes a 7-function wireless remote, though I don’t think I’ve ever considered ‘stop’ to be an actual function. Why not call it an 8-function remote since I’m sure it can idle too? You can find it at Diecast Model Car Collectibles for $29.98.